Adventures of Bug & Munch: Not exactly what I thought I was committing to at the time. Not exactly what I thought I was committing to at the time. Yesterday was Scott's and my 5th wedding anniversary. We have been through some stuff since we've been together: a few surgeries, selling a house, buying a house, moving, waiting and waiting for him to finally propose, planning a wedding, getting married, a couple more surgeries and two kids. Having kids. There's something that absolutely nothing that has happened to you in your life before can prepare you for how much it will change everything. Yet here we are; together, happy, and healthy. Maybe you thought from reading the title of this post that it would be about how marriage just isn't living up to all that I thought it would be. You'd be wrong. It's about my dinner last night. We went to Quiessence, a rustic yet elegant restaurant located on a farm in the foothills of South Mountain. It specializes in unique flavors prepared from local, organically grown ingredients and you know you are going to drop some bones when you make a reservation for dinner. But what the hay... we were celebrating! We prepared to have our palates wowed to soften the blow to the bank account. Our meal started with a complimentary champagne toast. So far, so good. They were out of our first choice of wine, but we were pleasantly surprised by the local Arizona wine they brought us instead. From Cochise County, no less. Who knew? So we're into the bottle of wine, down the starter fruit and cheese platter, and then came the salads. I had ordered the calamari salad. (I know. The emphasis on "local" fare kinda goes out the window when calamari in Arizona enters the picture.) 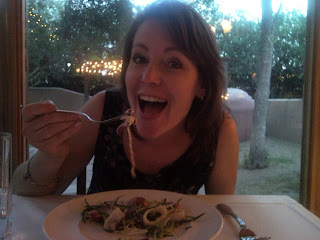 I've never raved about calamari, but the menu description of the salad had my mouth watering. I had only ever had it prepared one way: breaded and deep fried. A little a la T.G.I. Friday's for our location, but it was described on the menu as fried. So I guess I was expecting something pretty close to what is pictured below. 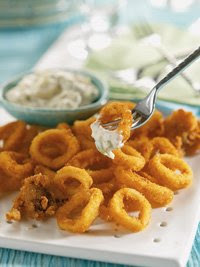 A salad with a few deep fried calamari rings tossed in and classed up a little to match the sophistication of the evening. Um, the calamari in my salad may or may not have been fried. It certainly wasn't breaded and it was most definitely not lacking tentacles. Long, curled up, covered with suction-thingy tentacles. I didn't eat a bit of it. The rest of the salad, as promised, was mouth watering. I ate every bit of it. And was left with a pile of squid limbs on my plate. Feeling a little embarrassed by having ordered the calamari salad and not eating any calamari, I considered wrapping it in a napkin and stuffing it in my purse. Purse not big enough. 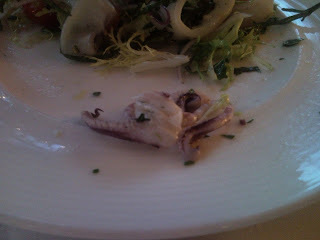 Scott had only eaten half of his (not calamari) salad, so we hid my pile of limbs under his untouched greens. Like they weren't gonna discover them and laugh their butts off at me in the kitchen anyway. Whatever. It was a nice place. It's not like they were going to spit in my grilled radicchio or something. The rest of our dinner was fabulous. 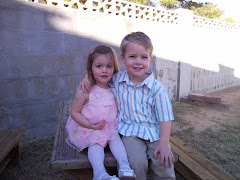 The evening ended up being a fitting tribute to five years of marriage with two kids to boot. Nice surprises, laughter and silliness, some tentativeness at not really being sure what we'd gotten ourselves into, taking things in stride, and just plain enjoying where we're at, even with a few unexpected limbs thrown into the mix. Happy Anniversary, Baby! I would cala-"marry" you all over again! Sorry I am commenting so late on some of your posts, but I have not had access to blogs for sometime as China has blocked a ton of websites. I can't even post on my own blog, but now I am in the US and no problem. I hope you have a a great anniversary! I love that restaurant! Too bad you were a little freaked by the squid, I guess after living in Asia for 4 years nothing put on my plate freaks me out anymore!